Party Poker is one of the leading poker rooms on-line and its software can be downloaded and installed in PC, Mac and Linux systems. A lot of action can be found here around the clock, especially at European peak hours. There are many special events and challenges to choose from and test your poker skills. If it's poker you desire, you will find on Party Poker all the regular and famous games such as Texas Hold'em, Omaha, Omaha Hi-Lo, 7-Card Stud and 7-Card Stud Hi-Lo. If you want to try your luck at Blackjack, you will find a single player Blackjack where you play against the dealer only, Mini Blackjack, Single Player Multi Hand Blackjack, where you can bet up to five hands of Blackjack and play them independently, and even Multi Player Multi Hand Blackjack. There is also an option to play various casino games, European Roulette, Bingo and Backgammon using the Party Poker software. In other words, the variety of games is enormous. Beginners who want to play poker can start playing at special Beginners tables where they can find other players that fit their poker level. These tables range from $0.02/$0.04 blinds and up to $1/$2. The stakes at the regular poker tables range from $0.02/$0.04 and up to $25/$50. Deposit Options: VISA, MasterCard, Paysafe card, eps (Australia), WebMoney, Bancontact Mister Cash, iDeal, Laser card, Click & Buy, Click2Pay, Bank Transfer, ukash, Przleway24, DirectPay24, my citadel wallet, Poli, eWire, ELV Germany/Austria), Electronic Transfer (Canada), UsemyBank (Canada/U.K. ), Switch/Solo/Maestro, Moneybookers, EntroPay, Neteller, bank wire transfer and Giro pay. Withdrawal Options: VISA, Mastercard, WebMoney, Bank Transfer, Switch/Solo/Maestro, (Canada), Neteller, Click2Pay, Moneybookers, bank wire transfer, my citadel wallet, Electronic Transfer, checks by mail and checks by courier. Support is available by e-mail and telephone 24 hours a day, 7 days a week. Response time is very quick by telephone. Support is also available in 12 different languages. 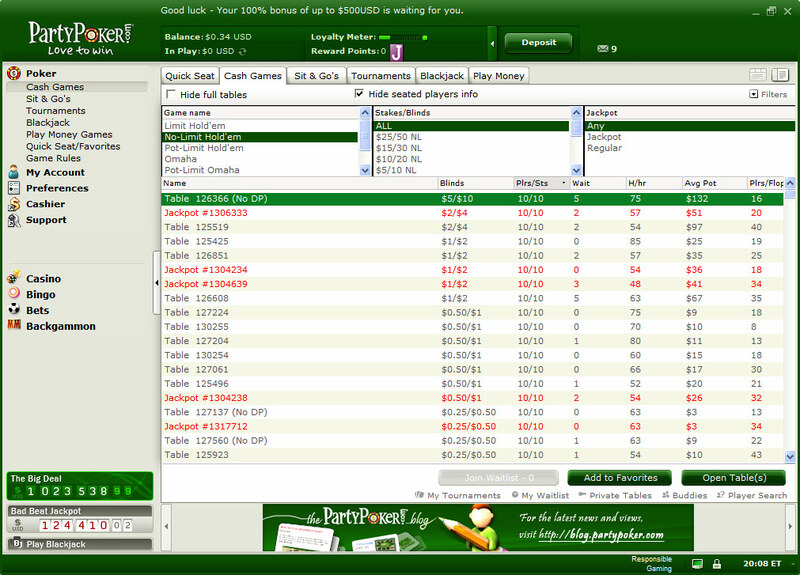 Party Poker offers various tournaments and Sit-N-Go (SNG) tournaments to play in. There are freerolls where you enter for free and have the opportunity to win cash and thus advance to even bigger tournaments or use the cash to play at the ring table. If you like spending a little but winning a whole lot of money, there are tournaments with buy-ins as low as $2 with an opportunity to win a prize pool of $8,000. You will also find it cheap to enter Shootout tournaments, where in order to win the tournament's prize pool you will have to eliminate the players from your table and advance to other tables all the way to the final table. Rebuy tournaments are also available, so you can always stay and play because even if you're out of chips, you can always rebuy your place at the table. Playing at Party Poker means earning points as you play. There are tournaments with great prize pools where the buy-ins are paid in Party Poker point and there is no need to spend cash. There are also special tournaments with huge prize pools. You will find Satellites to tournaments with prize pools of $1,000,000 as well Satellites to the world's biggest poker events such as the WSOP and monthly qualifiers to tournaments of $1,000,000! At for the SNG department, there is the option of playing against one other player (Heads-Up), 6 players and up to 10 players. If you're looking for more competition, there is the Multi-Table option to play against 20 players, 30 players and even 50 players. The buy-ins range from a minimum of $1 and up to a maximum of $5,010! There are also great SNG qualifiers, so you can find yourself playing against 5 or 9 other players for the opportunity to qualify to a tournament with a huge prize pool of $300,000! Party Poker offers you a nice signup bonus of 100% of your first deposit up to $500. New players receive even more when signing up. There's a poker school and also a chance to win a slice of $30,000 for free in time of 60 days from your first deposit. There are also tournaments worth $100,000 to enter for free each month. All that's left is to take your shot and just enjoy it all! - Party Poker offers a great special feature to players who qualify to the final table of their game. This special feature is called Deal Making and it allows the players at the final table of a tournament to make a deal for the entire or part of the remaining prize pool. 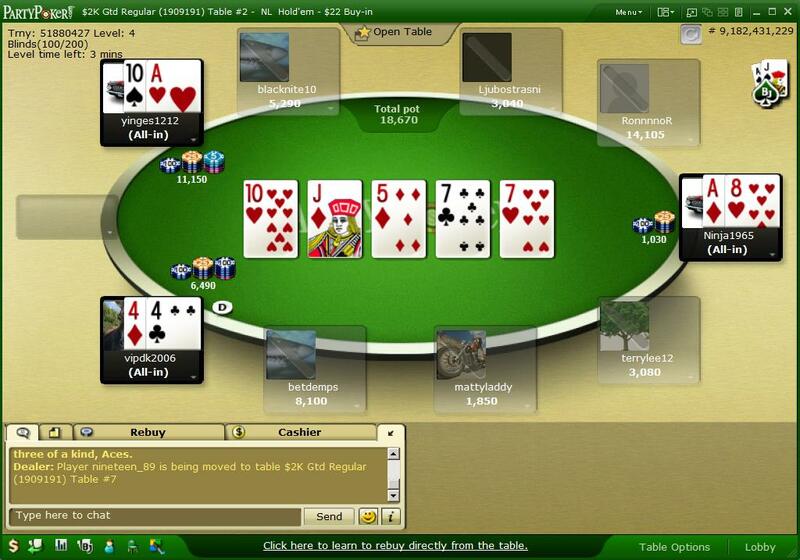 This great feature is available for most real money tables and Multi-Table tournaments with prize pool. - The Monthly Million. On the first Sunday of every month you will find the Monthly Million tournament with a prize pool of $1,000,000! Qualifying is easy and cheap, as there are satellites tournaments during the month for only $1. - Party Points. Playing for real money means earning points as well. The more you play the more points you earn and with these points you can purchase various products at the Party Poker Store, as well as enter tournaments and win prizes and money. - New Players Zone. There's a poker school and also a chance for new players to win their slice of $30,000 for free in time of 60 days from their first deposit. - Bankroll Builder. New players can win their share of $30,000 in this special and exclusive series of freerolls. It's a great chance to win big money, experience the world of tournament and it's all for free as you play against other beginners. - 50 Seat Frenzy. Party Poker offers 50 seats to the $300,000 Guaranteed Sunday tournament. The 50 Seat Frenzy is held every Saturday and there are three ways to qualify: finishing at the top 10 of the Daily Country-Specific Freerolls, playing the $2 Saturday morning 50 Seat Frenzy qualifiers or buying in directly for $15. - $300,000 Guaranteed Sunday. You can enter this huge tournament directly by paying $215 or qualify by playing 1 of 9 different qualifiers. - Bad Beat Jackpot. This Bad Beat Jackpot typically increases by $1,000 every hour. So if you lose your money with a monster hand, you may actually win back even more. - $1,500 Freeroll. New players can enjoy the opportunity to play this tournament for free and win a whole lot of money. - SNG Step Challenge. Play in this great SNG that's consisted of 6 levels. Each level consists of a 10-handed No-Limit SNG. By progressing through the levels, you can actually turn $3 into $2,000! Now that you know everything about one of the leading online poker rooms, it's time to play and win some money. To play better and master the game, I would suggest to you reading these poker articles and have a huge advantage over your opponents. Amazon has released the newest generation of Kindle - the Kindle 3G. Now you can store up to 3500 books on one device. Download any book and magazine anywhere in the world with no annual fees and it comes with a battery that lasts up to a month. Kindle 3G comes with a free 3G and Wi-Fi and the display is designed with New E Ink Pearl Technology for a better and smoother reading.